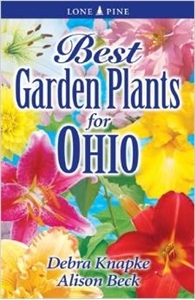 A great new gardening book for Ohio! This handy omnibus guide by Ohio's Garden Sage Debra Knapke and veteran garden writer Alison Beck is packed with over 300 of the best plant varieties you'll want for your garden: annuals, perennials, trees, shrubs, vines, climbers, roses, bulbs and herbs. Small enough to take to the garden center or nursery yet filled with beautiful color photos, it contains all the gardening information you need in order to decide which varieties to select and how to care for them.